Voted Top Meeting Site in Virginia and D.C. - 2018 ConventionSouth’s Reader Choice Awards. As Massanutten Resort’s sole food & beverage provider, we at Shenandoah Provisions take great pride in delivering enticing food and exceptional service. Your event is important to us and we will do our professional best to not only produce delicious cuisine, but remember all the little details to ensure your occasion is a memorable one. That’s the Massanutten difference. Behind every successful event is a stellar culinary experience. Shenandoah Provision’s Executive Chef Mike Ritenour has designed a range of catering menus that can be customized for your special event, whether you’re hosting 15 or 300 guests. From boxed lunches to three-course dinners and buffets, our talented team of culinary professionals will prepare a delicious dining experience with a focus on fresh, local ingredients. Whether your event is held at Massanutten Resort, area winery, or other special venue, let our skilled team bring our passion to your table. View sample menus here. We are pleased to offer lodging for guests who are not local and may need lodging for the special event. Group rates are available. Please view all accommodation options here. 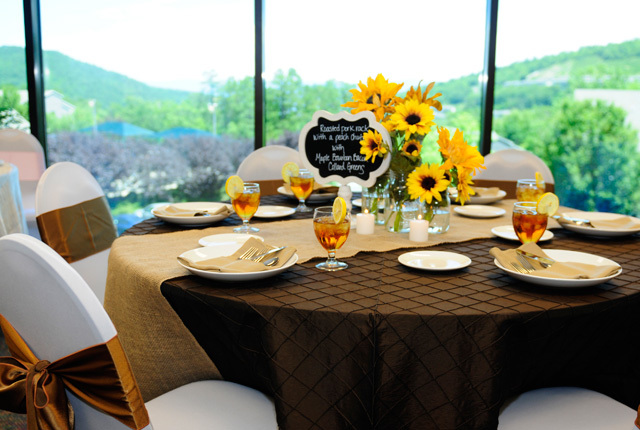 Shenandoah Provisions has had great success in banquet services; we have rented out and catered our facilities here at Massanutten Resort for more than 20 years and have decided to expand our services to include off-site catering to better serve our clients and guests. View sample menus here. Whether you envision an informal meal, banquet, or buffet-style gathering, our courteous, professional, and attentive catering staff will help you plan a customized menu to suit any appetite. Energize your guests with a Hot Plated Breakfast, Continental Breakfast, or Breakfast Buffet which can include breakfast classics like eggs, bacon, and pancakes or classy additions like Smoked Salmon & Bagels, Omelets, and Burritos. All options include unlimited coffee and tea as well as one glass of orange juice per person. Whether it’s coffee, iced tea, and lemonade or individual sodas and bottled water, we will make sure each guest’s thirst is quenched. Have a box lunch catered to your home or office. Choose the classic Deli meats & cheeses on a Kaiser roll, chips or brownie, and a soda for just $10 per person. Add on fruit or salad for a small upcharge. Served Cold Plate meals include favorites like our Chicken Caesar Salad, Virginia Cobb Salad, Tuna Salad Platter, Smoked Chicked Salad, and the Roasted Beef & Cheddar Sandwich. Wow the whole office with our Executive Lunch Buffet, including one salad, two entrees, one starch, and one vegetable hand-picked by you from a list of over 15 options! Choose from our popular Deli Buffet, Virginia BBQ Buffet, or Mexican Buffet, complete with build-your-own fajitas! All specialty lunch buffets include coffee, tea, and lemonade. We’ll bring our custom Smoker/Grill to you in this customizable menu all about the BBQ! Choose from a wide range of options including burgers, steak, lamb, pasta, salad, and more to make your barbecue one of a kind! Curb everyone’s appetites with bite-size snacks like Potato Cheddar Bites, Crudité, and Imported Cheese & Fruit. Roasted or grilled and hand carved to your specifications, our chef-attended carving stations are a huge hit with groups. We can provide items such as Steamship Round, Smoked Prime Rib, Venison Leg, Ham, Hearth Roasted Turkey, or Top Round. Our catered buffet is our most popular service. With the assistance of our staff, each guest will feel as if they were the first to grab a plate. This includes complete set-up, breakdown, and everything in between. Our Seated Dinner Service is a fantastic opportunity to give your guests an elegant restaurant-style catering experience. Each guest will be served at their seat, while food attendants refill beverages and clear empty dishes throughout the dinner service. Satisfy your guest’s sweet tooth with scrumptious desserts like fruit cobbler, pie, tarts, cakes, and ice cream. We are happy to accommodate your group’s dietary requirements and can create special menus upon request to ensure the enjoyment of each and every guest. Our beverage packages are sure to have everything you need for your guest’s beverage needs. An 18% gratuity and applicable sales taxes are added to all packages. With a full-service package, your guests will enjoy an open bar, with no worries of their consumption rate. Pricing includes mixers, garnish, glasses, bartender(s), set-up, and break-down. Time-Limit – Your guests may enjoy an open bar for a certain period of time. 20 minutes before your time limit is reached, the bartender will notify you of the time and you may decide to add more time for open bar or change to a cash bar for the remainder of your event. Cash-Limit – Once a pre-determined cash limit is reached for the bar, the bartender will tell you that you are at the limit. At that point, you can decide to add more to keep it open or change to a cash bar for the remainder of your event. Call Liquor Only – The host will specify the exact brand(s) of liquor to be used. Drinks may be purchased individually by the guests as a Cash bar or be billed to the event total, on a per drink basis, as a Host bar. A successful event is driven by a clear vision and flawless hospitality. Our knowledgeable banquet services team can help you select the right venue for your event, arrange accommodations for guests, finalize the catering menu, and offer recommendations for live entertainment, DJ’s, photographers, florists, and other vendors. Whether you prefer a traditional, elegant wedding; modern, chic wedding; or a southern-style wedding; our friendly and knowledgeable banquet services team is ready to make your wedding dreams come true. Our highly trained, dedicated event planners provide professional and personalized attention from the moment of inquiry to the end of the event. Schedule your tasting with Executive Chef Mike Ritenour today and let us help you create the event of your dreams! View sample menus here.